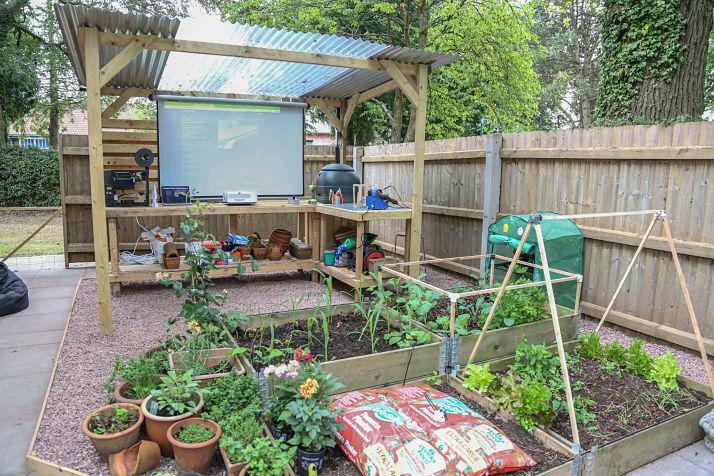 For less than £500 schools can build a compact and sustainable outdoor teaching space. James Hannam Director and Owner of MakerLabs, may have discovered a possible solution. In a recent case study with Casio Projectors James worked closely with HuntersHill College, a Special Secondary School near Birmingham. 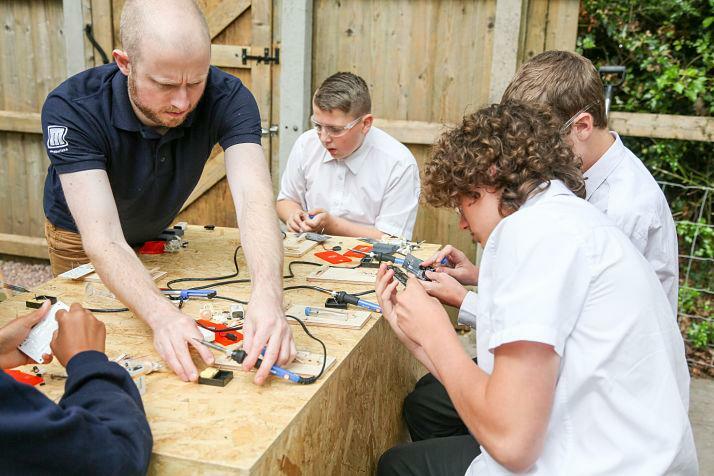 As part of an outdoor research project, where MakerLabs was commissioned to develop a range of outdoor STEM projects for students, he needed a space to work and test out project ideas and prototypes. Many schools are active in developing an awareness for outdoor education, from sustainable energy, to a better appreciation for the surrounding environment. A major theme in recent years has been based around ‘coding’ and ‘computing in the curriculum’. With that in mind the challenge was set to develop a prototype space that would encourage teachers and students outside, and away from the classroom. MakerLabs, with their pedigree in education, STEM and the maker movement, were tasked with producing a ‘show room’ style work space that would be suitable to both financially and practically encourage schools to create outdoor education spaces that weren’t just gimmicks or fads. Typically, outside spaces on school sites is limited, the challenge was to design a covered outdoor workspace for 10-20 students plus two teaching members of staff. The concept was to have a main covered space that could house the majority of students, plus an area to allow students to grow fruit and vegetables and test out a range of electronics. The area would initially need power, and a place to store rainwater. After the initial setup the aim is to work on a power generation ‘challenge’ project with Yr 9 students! Additional teaching resources would come in the form of an Apple TV (to allow teachers to mirror devices to the teaching screen), Apple Airport Extreme (to provide a super low cost WiFi solution) plus one of Casio’s lamp-free projectors. Eventually the covered area would take up 3m x 3m, with 4 sets of 1m x 1m growing beds, with space to expand at a later date. A low cost solution to raised growing beds and a great upcycling opportunity are known as ‘pallet raisers’. You can typically see them in the warehouse section of IKEA and are used to create a wall around the edge of pallets when they are loaded with plant pots or smaller items. They are far cheaper, and easier to handle, than sleepers! Pallet raisers typically cost £3-5 each. An added benefit is that they are lightweight and easy to stack...ideal for growing large amounts of potatoes! The most expensive element of the build was the water capture system. Mainly due to time constraints, we had to go with an ‘off the shelf’ solution, which costed almost the same as the whole material list for the shelter. The project could be easily repeated with either a recycled container, or (our preference) a reconditioned IBC (Immediate Bulk Container). IBCs can hold 1000 ltrs and usually cost no more than £75. Both the guttering and downpipe were recycled, as were the clips. The roofing uses recycled galvanized corrugated sheet as well as some new clear plastic sheeting to provide some light into the work area. Searching for a source of low cost and high quality sustainable materials led us to the Jericho Foundation, a charity that recycles materials from building sites across the country. The wooden frame and benching were made from recycled long pallet wood lengths, which were cut to length. A simple frame for the benches was made by creating 6 uprights and 4 horizontal bars, then cladding the top and bottom with long pallet lengths. Once attached to the main shelter uprights, this gave a suitably stable and rigid workbench. The main structure of the shelter were 3.5m lengths of 50x100mm beams. They were buried and set into the ground with 2 bags of post mix. The top of the shelter used the same 50x100mm beams cut to size. The reason for using 3.5m lengths was that the slope of the roof meant the beams would need to be slightly longer than 3m to provide a suitable incline to allow the rain water to run off. Wiring and electrics were completed by a qualified electrician. As a proof of concept we used a simple, lockable isolated outdoor extension kit. This allows staff to isolate the power when the outdoor area is not used. Overcoming the "The Disease of Busyness"